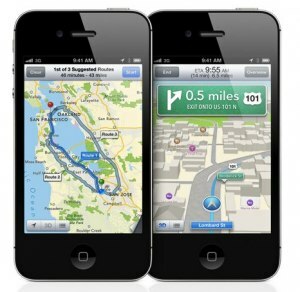 Ever since Apple launched iOS6 with their brand new Apple Maps, the web has been flooded with reports, posts, tweets and even special tumbler blogs dedicated to pointing out how ‘catastrophically bad’ Apple’s Maps product is. The cacophony reached a crescendo on Friday with this post from the normally respectable Business Insider, pointing out how the portion of map used for the icon for the Apple Maps app isn’t 100% cartographically accurate. The freaking icon. Is it just me, or is this getting stupid? Sure, it’s the first version of a product and they have some work to do. We can all point out problems and issues with it. I work for Nokia building Nokia Maps, and I know how complex a map and navigation product is. But are these kinds of relentless and ultimately pointless attacks proving anything? My seventh grade science teacher used to call it the “Tall Poppy Syndrome”. In a field of poppy flowers, when one poppy grows taller than all the others, the other poppies do whatever they can to pull it back down again. That’s what’s happening here. We have all sat by in wonder, awe and respect as Apple charted their amazing course to recovery to become the most valuable company on the planet. And yet now the world that rocketed Apple to success is trying to pull that poppy down again. The Germans have a fantastic word in their language: Schadenfreude (n). Literally translated it means the happiness you feel at experiencing the misfortune of others. There’s even an adjective form: schadenfroh. It seems the entire tech world is enjoying seeing Apple squirm after the barrage of negative feedback and criticism over the Maps product. A whole sea of schadenfroh tech journalists, bloggers and consumers smiling to each other and insisting that they could have done better or would have advised Apple differently. Even as the iPhone5 broke all kinds of sales records at its launch last weekend, it clearly wasn’t ‘good enough’, as Wall Street was disappointed, and that makes tech bloggers sad. This entry was posted in Location based services, Product Design and tagged apple, iOS6, maps, schadenfreude, tall poppy, tall poppy syndrome. Bookmark the permalink.